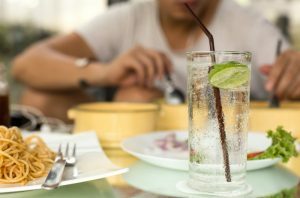 Seltzer Water – Is it Harmful For Your Teeth? You’ve replaced your soda habit with seltzer water! While getting rid of the sugar may be helping your overall health, what about your teeth? Could seltzer water still present a problem for your teeth? Your dentist in Scripps Ranch shares the truth about drinking seltzer water. Your mouth relies on a healthy pH balance in order to avoid tooth decay and cavities. Consuming drinks like water with a neutral pH helps you maintain a healthy environment in your mouth. However, when you add carbonation to water, it also adds acid and lowers the pH level. Adding fruit flavoring increases acid levels and lowers pH even more. Higher levels of acid in your mouth leave your teeth more susceptible to enamel erosion and cavities. Can I Still Drink Seltzer Water? The good news is that you can still drink seltzer water a few times a week without worrying too much about damaging your teeth. Just don’t drink it every day. You might also consider switching to mineral water that still has carbonation, but at a lower pressure, which keeps the pH level more balanced. These types of water are a bit more expensive, but are better for your teeth in the long run. You can also chew xylitol gum after drinking an acidic beverage to help protect your teeth. Xylitol is a natural sweetener that actually neutralizes the acids in your mouth that cause enamel erosion. Chewing it for two minutes after drinking your beverage will help to reduce your risk of developing tooth decay and cavities. You know fruits and veggies are good for your body, but did you realize that they are also good for your oral health? They help to neutralize the acids in your mouth and increase saliva flow. This helps to wash away excess debris and food particles, while also reducing your risk of developing cavities. Contact your dentist if you have questions about which foods and beverages are the right choices for your oral health. Dr. Greg Friedman and his new associate Dr. Kory Grahl complete your dental dream team at Mod Squad Dental. For over 25 years Dr. Friedman has been providing high quality dentistry to his patients in a comfortable spa-like atmosphere. The reputation he has built over the years is the reason that Dr. Friedman is the family dentist that Scripps Ranch residents trust. If you would like to contact Mod Squad Dental, we can be reached through our website or by calling 858-547-0070.